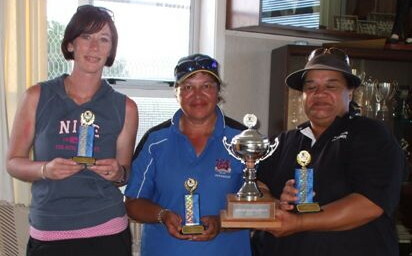 The Trans-Tasman qualifying event was held at Herne Bay over the weekend. Five Women's Doubles teams and eight Men's Doubles teams took part. Reserves: Nicola Brock (Kennedy Park), Ruby Vakauta (Victoria Park), Michael Rocks (Khandallah), Enoka Smiler (Park Avenue). Thirty-eight teams from around the country took part in the second National Senior Doubles played over the weekend in Christchurch. In the Trophy final, Doug and Helene Hay (Masterton) beat Sue and Trevor Neilson (Rotorua) 13-9. The Plate final was a much closer affair with Kath and Kaye Alison (Kapiti) edging out Joan Miller and Ralph Priddle (Masterton) 13-11. Yvonne Futcher, Monica Smiler and Nikki Winnie won the Trophy section beating Barbara Johnston, Joan Miller and Claire Wilson 13-11 in the final. The Plate was won by Margret Fleck, Richard Lawson, Maureen Wood and the Bowl by Edmund Dickie, Karepa Mataira and Clive Williams. There is an entry fee of $60.00 per club (same as last year). Note: Because there is only one round to be played on this day I propose that a melee tournament be organised at each zone for the afternoon. This will fill the day out and make the travel more worth while and will give players from different clubs a chance to play together. The whole competition will take 4 playing days. We will end up with a zone champion (i.e. the winners of each zone after the five preliminary rounds). Clubs will then be divided into divisions - i.e. Division One will be contested between the top two teams from each zone and the second division will be contested between the 3rd and 4th teams in each zone. The 3rd division will be played between the 5th placed teams from each zone. I will explain all this better when the draw is sent out.